In Dane County a primary factor lending toward intractable poverty is the shortage of affordable housing units and the high cost of rental units. The data charts below illustrate the extent of housing challenges for lower income households in the County. A significant portion of household income is allocated towards housing. The definition of housing affordability is based on the percent of household income spent on housing. Housing expenditures upwards of 30% of household income are regarded as a ‘cost burden’ and are considered not affordable. [i] In places like Dane County – where occupancy rates are high and available units low for affordable units – households often spend more than 30% of income on housing or rent. In Dane County, 32.8% of households are considered cost-burdened. [ii] These households must stretch their household budget in multiple ways, and have higher rates of eviction and/or leaving housing due to inability to cover rent. The Dane County Housing Initiative has produced a report that provides details on housing demand and supply. This report lays the groundwork for greater investment in creating workforce or affordable housing. The following graphs from the UW-Madison Applied Population Laboratory [iii], illustrate the challenge of the high cost of housing for limited income rental households. 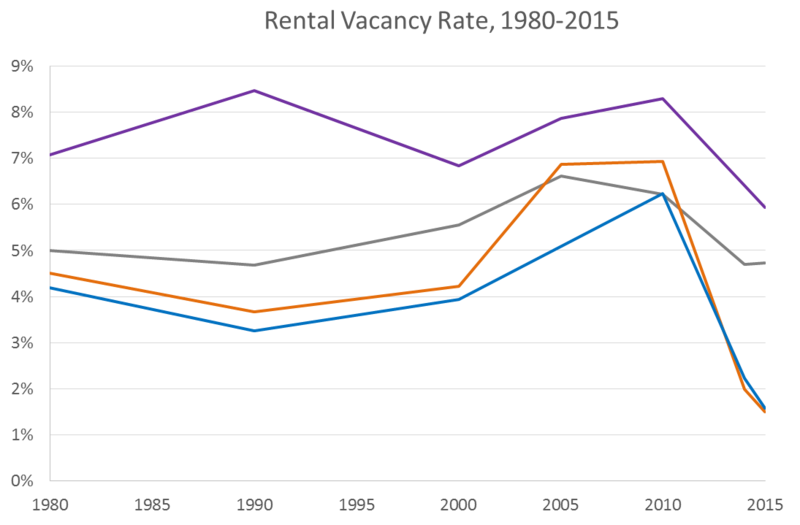 Chart 1 shows that the availability of rental units is very low (indicated by rental vacancy rates). The steep drop in available units since 2010 runs counter to the development boom seen in the city of Madison. While there has been an uptick in construction of condos and owner occupied units, there is a notable shortage of affordable rental units. The high demand for rental units, coupled with low availability, can lead to higher market prices for non-subsidized units (Chart 2). Chart 3 illustrates that the cost burden rate has been rising steadily – both locally and nationally – from 1999-2010. 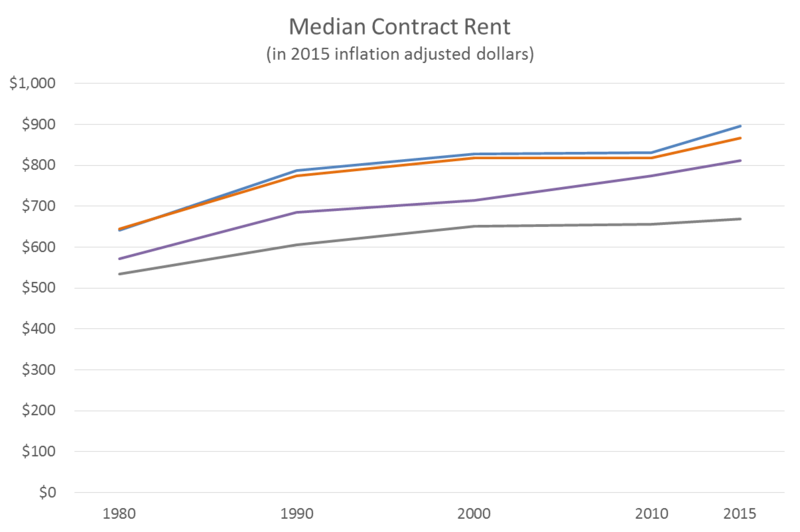 Currently, in Madison and Dane County, cost burden rates are upwards of or close to 50% for all renters. This high rate of rent burden is experienced primarily by limited income households or those households in poverty. There is also an undeniable component of racial inequity with regards poverty and high rental rates. 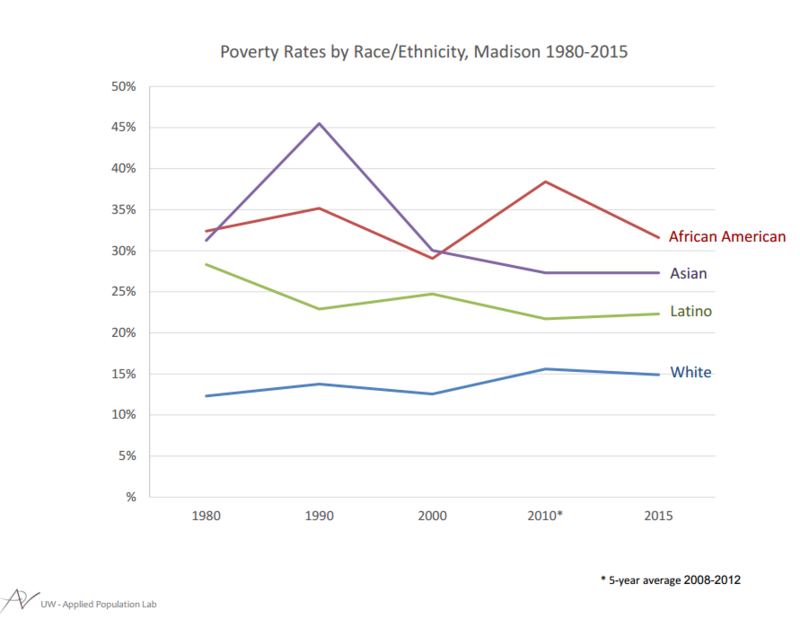 Chart 4 illustrates the high poverty rate experienced by people of color in Madison (note that this particular chart is for Madison only). 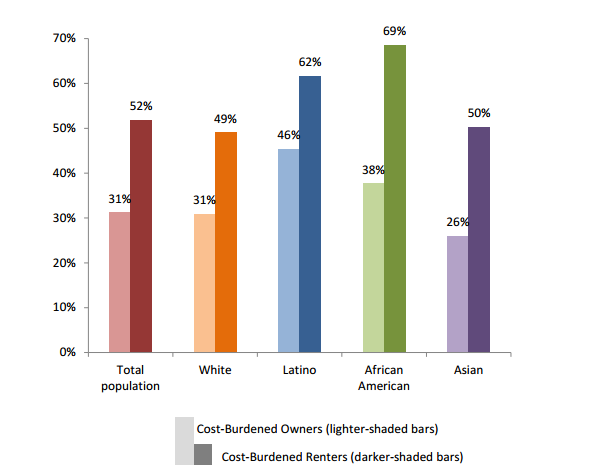 Chart 5[iv] graphically portrays the disproportionate burden of cost burden, by race, both for owner-occupied housing and rental units. 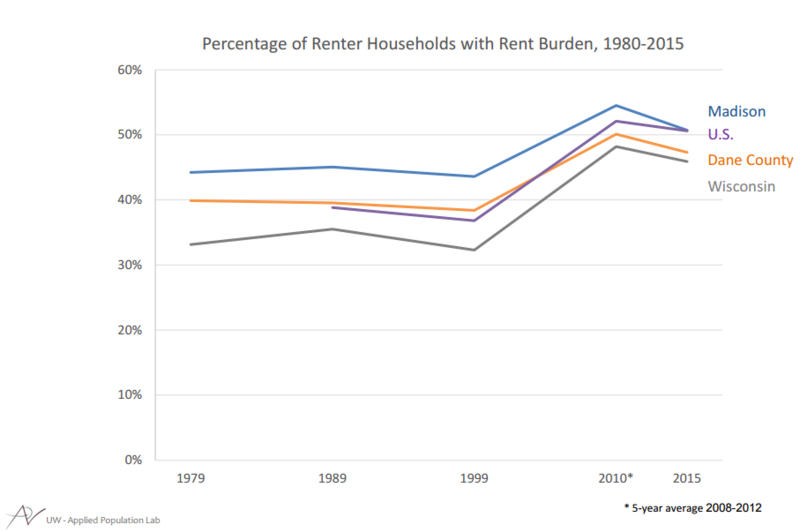 The cost burden is consistently higher for renters than for home-owners. Until the cost burden of housing can be decreased, it will be difficult for limited and low income households to achieve housing stability, and potential for economic security that comes from having a secure place to live. One antidote for Dane County is to increase the availability of affordable housing units, both for owner occupied and rental markets.